I’ve linked to articles in the past that I felt were particularly valuable for understanding or conveying why there is controversy surrounding Lyme disease diagnosis and treatment (not a small or simple topic). I’ll re-link to some of those here as well, but first, here are some very recent must reads to that end. They will help you better understand the parts and pieces, help others understand where you are coming from better, or at the very least impress you as impressive syntheses of parts and pieces you already know. Whichever category is the case for you, these are links you need to have saved. Controversy over Lyme disease has sharply divided the medical community, resulting in two competing standards of care that disagree on most aspects of the disease, including diagnosis and treatment. The center of the debate is over the existence of chronic Lyme, also referred to as “persistent infection,” which means that some Lyme bacteria can tolerate and survive antibiotic treatment. The view enforced by IDSA is that Lyme disease is easy to diagnose and simple to treat with a limited course of antibiotics. According to the IDSA guidelines, chronic Lyme does not exist and long-term antibiotic treatment is not warranted. The IDSA guidelines were developed in close coordination with the CDC and are followed by most physicians and used by insurers to determine limits on coverage. The Patient Centered Care Advocacy Group (PCC Group) says it has documented a deliberate misinformation campaign by Infectious Diseases Society of America (IDSA) panelists who are tasked with updating IDSA’s guidelines for the diagnosis and treatment of Lyme disease. The PCC Group cites the article IDSA Lyme Guidelines Panelists Engage in Coordinated Propaganda Campaign, by Bruce Fries of theMayday Project Lyme patient advocacy group. The article claims to provide detailed evidence about an organized propaganda campaign by the IDSA Ad Hoc International Lyme Disease Group. According to an analysis of CDC emails obtained via a FOIA request by science writer Kris Newby, the Ad Hoc group has been covertly setting government policy on Lyme disease and misinforming the public about the disease for the past decade. 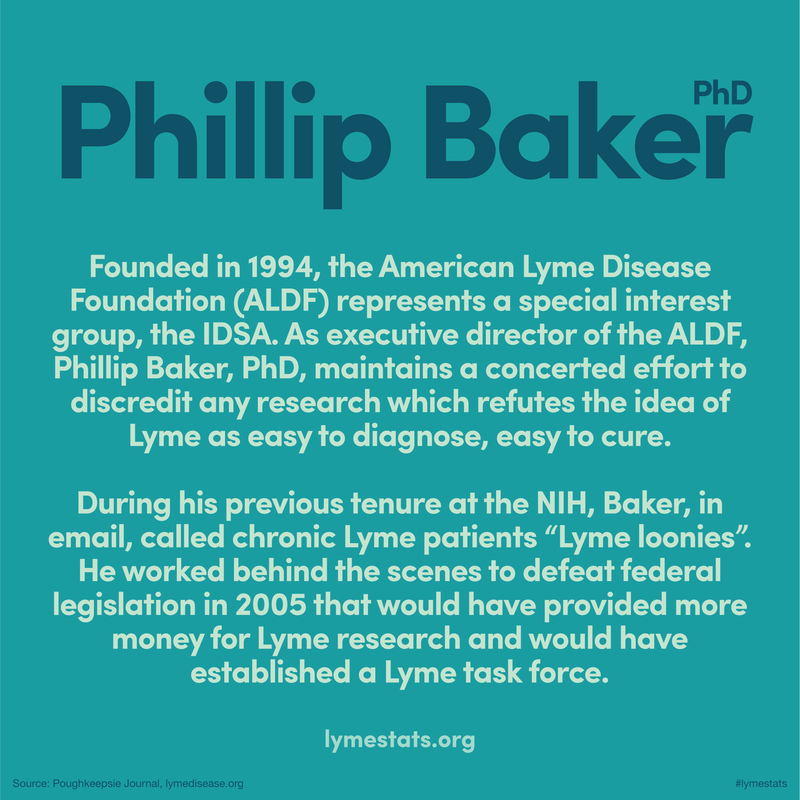 Since they were first published in 2000, the IDSA guidelines for Lyme disease have been the subject of intense controversy, including an antitrust investigation. Debate focuses on the existence of chronic Lyme disease, also referred to as “persistent infection,” meaning some Lyme bacteria tolerate and survive antibiotic treatment. The view enforced by IDSA is that Lyme disease is easy to diagnose and simple to treat with a limited course of antibiotics. According to the IDSA guidelines, chronic Lyme does not exist and long-term antibiotic treatment is not warranted. Many physicians adhere to the IDSA guidelines and insurance companies use the guidelines to set coverage limits. Hundreds of peer-reviewed articles now support the ILADS position. These articles document many ways that Lyme bacteria can evade the immune system and survive antibiotic treatment. 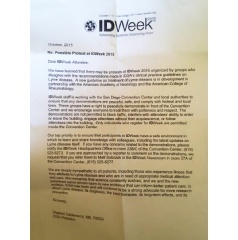 While Dr. Calderwood’s letter told attendees the IDSA was “deeply sympathetic to all patients, including those who experience illness that they attribute to Lyme disease,” demonstrators say they don’t want IDSA sympathy. What they want is for the IDSA to learn from patient suffering.